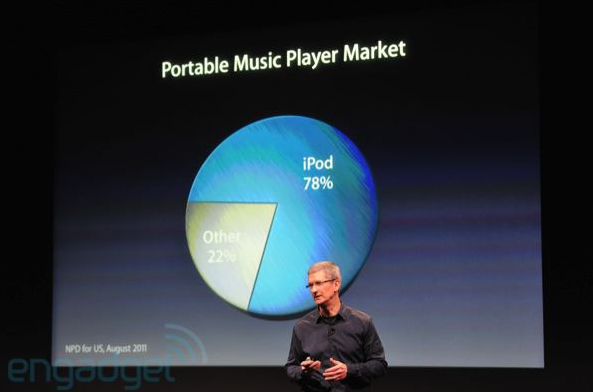 At Apple’s Let’s Talk iPhone event ’11, the music market share for the Apple iPod has been revealed at 78%. That’s 300 Million iPods sold since its launch 10 years ago, one huge and impressive stat to keep an eye on. In July 2010 to June 2011, 45 Million iPods were sold, half of which are going to completely new iPod owners which could potentially convert these users into Apple consumers. This makes Apple the number one music store in the world with over 20 Million songs in its library, and 16 Billion songs already downloaded from iTunes. The announcement was made at Apple’s “Let’s Talk iPhone” event held at the company’s Cupertino headquarters. This iPhone is completely compatible with Apple’s new iOS 5 software. iOS 5 is the next major revision to Apple’s software for iPhone, iPod, Apple TV and iPad devices. You can see our complete rundown of the iOS announcements back at WWDC here. We’ve also got a closer look at some of the features of iOS like iMessages, Twitter, Setup and Notification Center, iCloud and alerts.